Take a summer snapshot of an Italian town square and it’s a safe bet the children at the tables outside the neighbourhood trattoria who are wearing more of their food than is left on the plate are foreigners. By contrast, the other worldly sophistication of the nation’s bimbi is striking: sitting quietly, eating their pasta, and remaining patiently at the end of the meal while parents and family friends say their goodbyes. Table manners are indicative of the social value placed on food by mums and dads across the peninsula, and the early exposure they receive to food culture in general. This exposure includes ensuring young children roll their sleeves up soon after discarding the baby grow and get involved in the kitchen. Not only does this provide the foundations for a life skill but it ensures that children develop an appreciation of nature and the raw ingredients used in the cooking process. All young children love using their hands, and if there is a little mess involved, then so much the better. 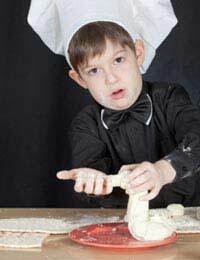 So why not adopt this aspect of Italian life in your own home by passing your child a big bowl containing flour, yeast and warm water, and allowing them to mix their first pizza dough. There can’t be many kids that don’t like pizza, allergies permitting, so there is the promise of a reward at the end of the process. It won’t be long before a healthy competition has arisen either between siblings or school friends as to who can make the best base. There is also the added excitement of each choosing their preferred topping, and the bonus for mum and dad in being able to regulate the amount of salt and sugar in the finished product, something not possible when purchasing commercially made pizzas. The same is true of pasta. Again a bowl with flour and, this time, egg yolks, and away they go. Generations of children grew up having a great time with Plasticine. Dough has something of the same feel; equally, it can be fashioned into a myriad of shapes with a pastry cutter. Older children will be only too eager to try their hand at a pasta machine. And when it comes to stuffing and rolling up cannelloni, for example, well there’s plenty of fun to be had there. The results may not be perfect but be sure to proudly boast to friends that they are enjoying the first efforts of the next generation of cooks in your house. The same is true of stuffed parcels such as cappelletti or ravioli. The laborious task of cake decoration is one that children will be only too happy to take on, satisfying not only their natural instinct to be creative but also placing them in close proximity to fruit preserves, nuts and icing sugar. Children quickly develop their cooking skills and graduate from simply having fun with textures and flavours to taking on more responsibly and getting involved in a wide range of preparation and cooking processes. Once they understand that food is much more than simply fuel, their growing appreciation will extend to actually taking the time to taste their food and pick out the flavours from individual ingredients. That in itself should ensure that the next time you are seated around a table outside your favourite trattoria, the children don’t end up looking like they’re wearing an item from Lady Gaga’s wardrobe.